In the last ten days, three of the blogs I have followed – and kept listed at the bottom of the left column on my other site – have been crippled or deleted by service providers. There seems to be a sudden, worldwide effort to implement dramatic suppression of internet freedom. 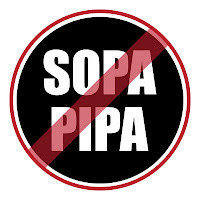 It appears that the impetus may originate with the U$ FBI, which may be acting to enforce stymied SOPA/PIPA legislation. In effect, enforcement is happening because corporations have pulled the strings of their politician servants, who so far have not been able to legislate internet repression because of public outrage. What we witness is a battle over intellectual property rights. It is prudent, for our sanity, to understand that we live in a capitalist system where property rights trump all other rights. In an era when corporations are deemed to be humans, where that particular race of humans has unlimited access to and control over the politicians that rule our lives, how could it be otherwise? Until and unless the system itself is changed so that human rights are the basis for society, there will be endless battles between people like us – the 99% – and the privileged few cloaked in corporate power. I have been scrupulous to avoid copyright violations when posting to my other Rhythm Connection site, and totally open to remove posts if someone who owns the intellectual property right to a recording requests I delete it. Yet realistically, considering the obscurity of copyright tendrils that may exist among corporations – and most likely do not connect to musicians, by the way – I may inadvertently violate rights, when I intend only to help preserve for humanity valuable works of art. So there is the possibility that my blog may be eliminated by corporate action, as the battle for a free internet broadens. I may try to mirror that blog or move it here, but I’ll attempt to carry on there until Google bows to its master. I wake light rising house sparrows jabbering in the verdant shadows like mexican abuelitas comparing travesties of past husbands and walk seven blocks past sleepy store openings and snorting buses and past a flatbed truck unloading its gristly pile of half-cows already swarming with flies into the market I cross to a chocolate factory for first and last chocolate con leche walk back to eat breakfast alone before colectivo arrives to carry me away too early to airport check pack no charge and take binoculars wander outside expecting grackles but finding plenty plus a lifer pass security with shoes on and full water bottle mount plane via stairs with last breath of oaxaca air to enter sterile time capsule that disconnects people from one reality and dumps them into another having endured various levels of abuse this time into mexico mexico chaos after three point five hours of nonstop animated chatter about make-up and lovers and qualquiera cosa between the two señoras seated next to me sounding like magpies or grackles or self-same sparrows not knowing I hablo español grounded again I eat last tacos al pastor check pack to alaska gratis again pass security with shoes and water to gate where boarding every person is patted down including frail old lady dressed in lime chiffon and carry-ons scrutinized by stern tsa sorts until ensued delay had them rush last fifty passengers including me without even checking boarding passes for long boring flight to L A where the full national paranoia blossoms in obtuse procedures interminable lines and pointless demeaning ignomities a man drops his windoze laptop on my shoeless foot before the xray machine which hurts like hell but the man is relieved my toes broke the fall of his dell then they pat me down once through portal despite green light and again with pen and wallet now in hand he finds ipod headphones in cargo pocket insists I go back and put them in a tray through the xray still holding up the long long cueue my shoes and pack hanging abandoned and cleared they pat me down yet again even though they cannot see the zapatista tshirt I wear underneath fuming I don shoes amidst others humiliated wondering is this how life should be until without further incident we fly to seattle and are disgorged post midnight into a shuttered airport with zombies walking aimlessly or lying prone on seats or floor but it all is familiar now and after four hours of mock sleep I buy a bagel with cream cheese and lox like usual and a triple shot short cappuccino to greet the day and know I am almost home.